When it comes to eating a great burger I am picky. The meat must be good quality and the cook must be medium/medium rare (nice and pink in the fully cooked warm center). I love to see the juices running down the burger. I end up eating a lot of burgers. The reason is really simple; I always think that it is a safe thing to order in a restaurant of which I am unfamiliar. I don’t know how accurate that is, since plenty of people still screw it up. I am often served overcooked hockey pucks with wilted lettuce, mealy tomatoes, tasteless cheeses, and greasy fries; heartburn city. However, a year ago, I think I found one of the best burgers in Napa Valley. 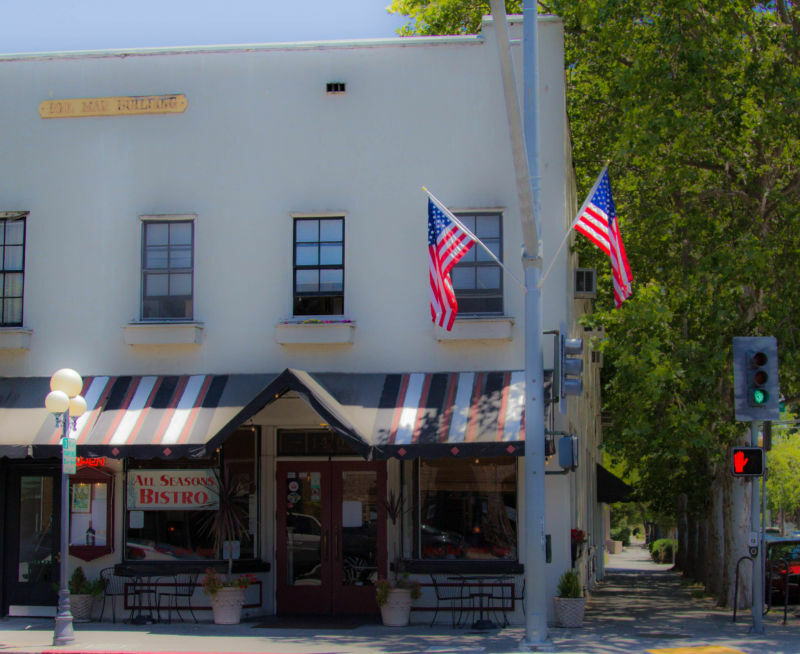 We were in Calistoga for our celebration of Valentine’s Day when we stopped in at The All Seasons Bistro. For those of you who haven’t been to the adorable town of Calistoga it is a worthwhile visit. They have a natural hot spring, beautiful mineral waters, and of course it is in the heart of wine country. What more could you want? They also have tons of restaurants and little shops to peruse while you enjoy the beautiful atmosphere. The Brit looked up reviews of the restaurants in town and he decided on All Seasons Bistro for our visit. The outside of the restaurant is cute. It is in an old building and it has an almost French bistro cafe look. 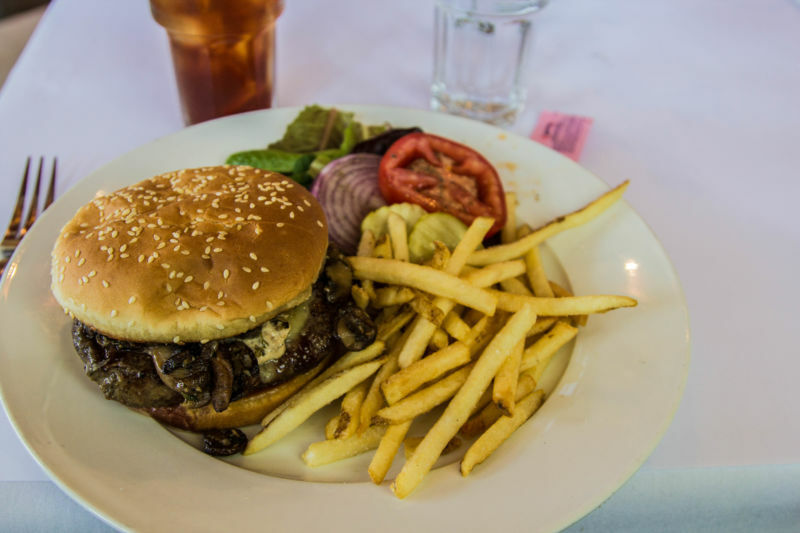 I ordered their Angus Burger with truffle aoili, Gruyère cheese, and mushrooms. History was made; I was in heaven. I raved and raved about that burger. It was simply DELICIOUS! The Brit Comments: California Girl is convinced, not without justification, that I always end up ordering the better dish when we dine out. 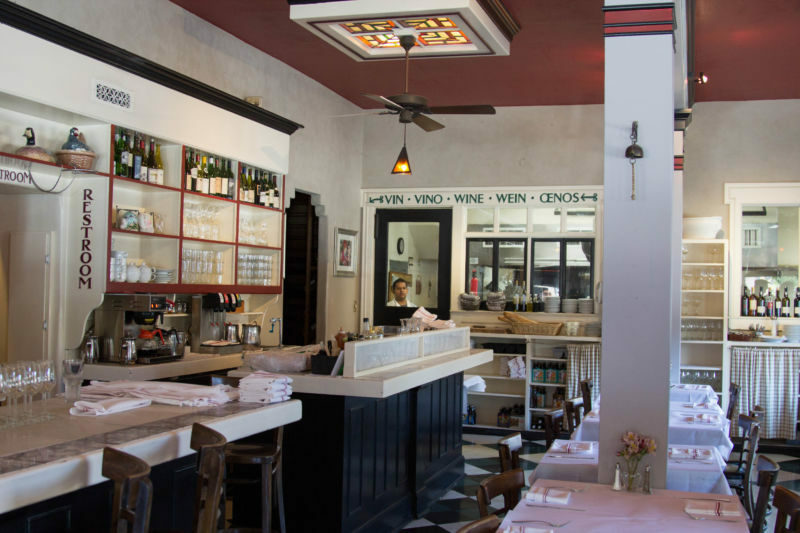 Our first visit to this bistro was a very notable exception. My ahi was good, but the burger was extraordinary. Fast forward a year, and The Brit decided to take me back to see if our experience was a fluke, and I would still be so in love with the burger. I had built this burger up and put it on a pedestal. I couldn’t tell you then what was so crazy good about this particular burger. I wasn’t writing the blog then, so I wasn’t really thinking about what I was tasting in detail. Now focusing on the flavors: tasting the aoili which had a gorgeous Dijon and truffle flavor combined with mushrooms and cheese, I knew what was rocking my world. I am thrilled to report that after returning to the All Seasons Bistro, they indeed hold the key to my burger heart. The Brit and our niece from Chicago were both in agreement. Burger heaven was indeed ours. The Brit Comments: I was not going to make the same mistake twice, I ordered the burger. My only criticism was that the side salad appeared to have been seasoned by the cook from Alice in wonderland, as it was covered by pepper. Since my focus was on eating the juicy burger and not the salad, this did not impair my enjoyment. A year ago, I didn’t know anything about the bistro. But on this visit we had the opportunity to meet the owner. What a sweet man he is! 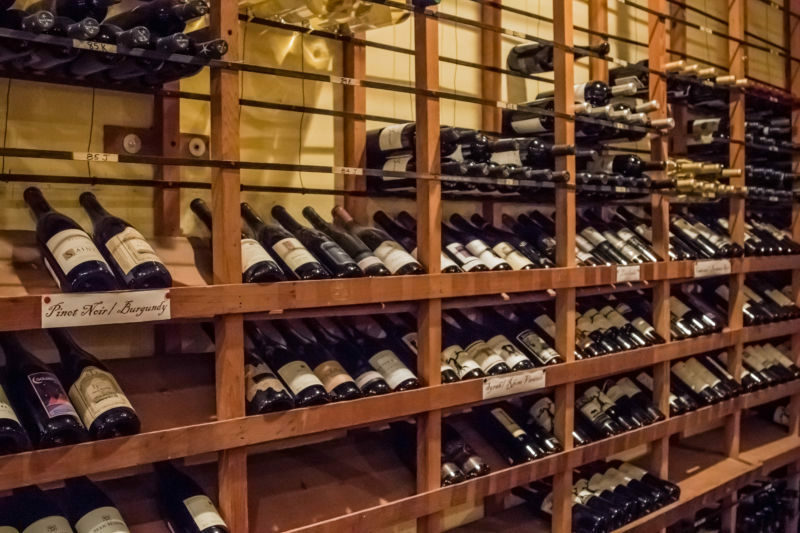 He gave us a tour of his restaurant and we got a huge surprise; he has a very extensive wine room. He gave us the opportunity to look through his collection and told us a little bit of history about himself; how he came to the valley in the mid 1960’s and his family’s many restaurants (of which several are located in Calistoga). We learned that he also owns the restaurant/bar across the street from All Seasons Bistro called Hydro Bar and Grill. We will have to check that out next time if I can tear myself away from that burger. Honestly, the chances aren’t good I will be able to resist its juicy call. Let’s put this out there so you can understand just how good this burger is: The Brit is one of those disgusting self-disciplined people who doesn’t overeat. He often passes on desserts other than ice cream or sorbet. So you know he loved the burger when he ate his entire plate and the 1/4 burger that was left on my plate as well. He didn’t want it to go to waste. If that isn’t a huge endorsement, I don’t know what is. 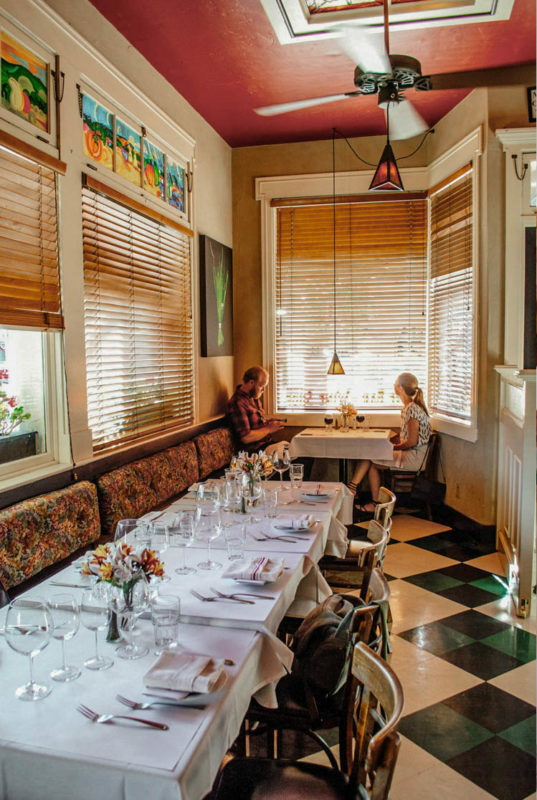 Pingback: Calistoga Inn Restaurant, Calistoga, Ca.